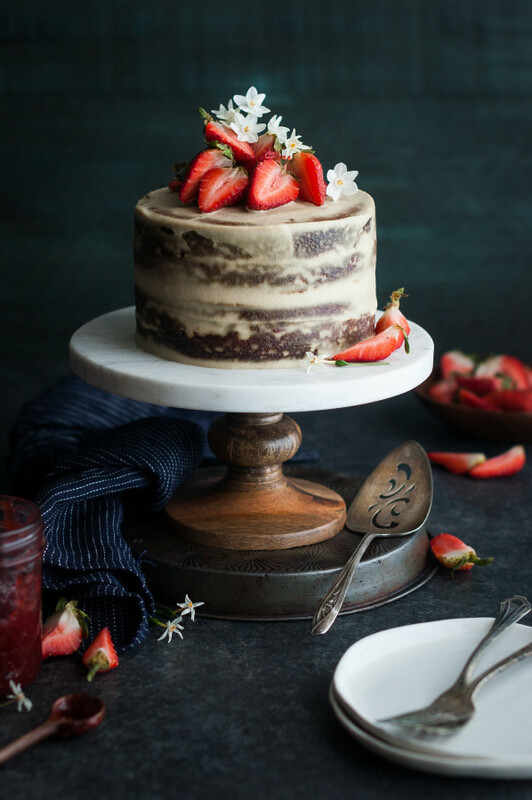 *This Strawberry Vanilla Almond Cream Layer Cake is gluten-free, dairy-free, and refined sugar-free. It’s no secret that I love cake. When giving up things like white sugar and flours, even trying to avoid wheat flours in general, cake becomes a somewhat impossible seeming sort of dessert to be able to enjoy any more. At the same level, anyway. Cakes made with refined sugar and white flour are so easy to make, I now realize. Achieving a soft, moist cake with the right amount of sweetness is almost a no-brainer (though I will admit that those same cakes I speak of have become unbearably sweet to me now – my tastes have changed and I really prefer sweet things to be on the lesser end of the spectrum). That’s how our modern day cakes with the perfect texture and taste came to be, isn’t it? By modifying ingredients that have always been available to the point that they performed exactly how we wanted them to but became entirely stripped of their nutrients and became more harmful than nutritious. 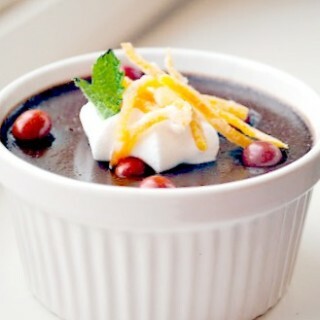 That is my goal when it comes to the recipes I put on this blog. 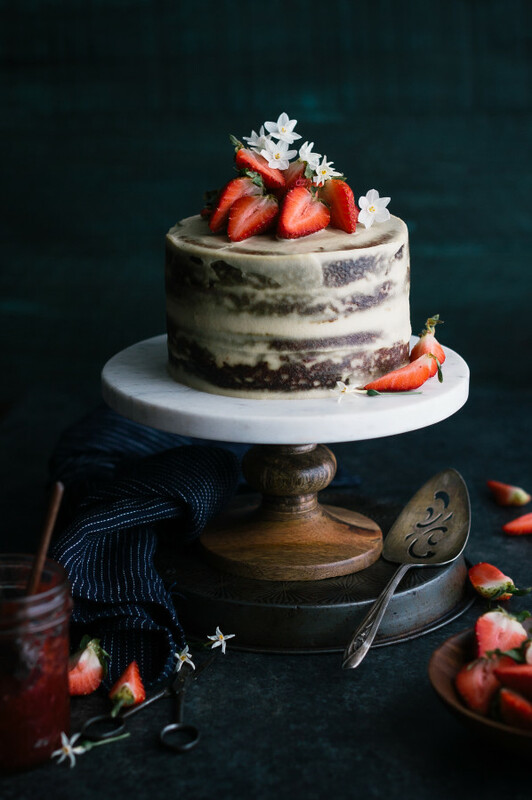 I want to bring you recipes (like this cake) that are just as good as the things that I used to make (with refined and processed ingredients) but that are made with whole, nutritious ingredients instead. That was what I had in mind when I made this cake. I really wanted a nice almond cake with layers of strawberry jam but that didn’t contain any grain, dairy or refined sugar. To tell you the truth, I thought I completely failed when I pulled the cakes out of their pans and found them to be much denser than I had hoped for. 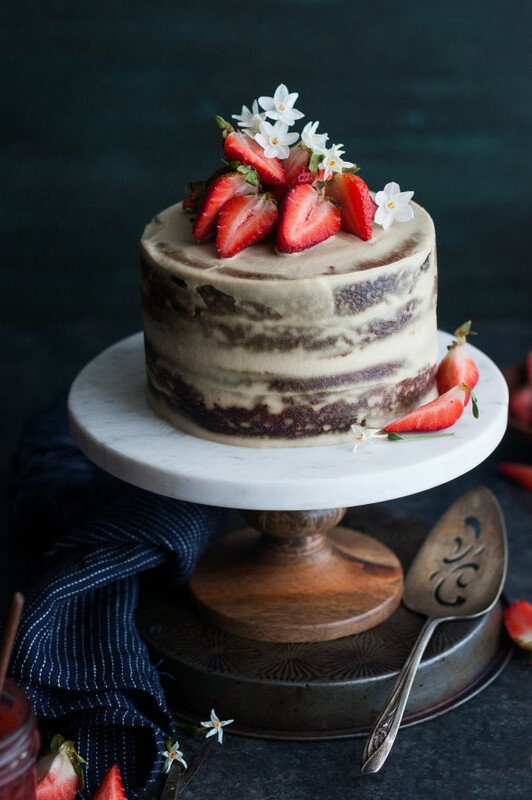 So, I spread the layers with a strawberry jam, frosted it with a thin layer of cashew frosting and we took the cake with us to my parents for Sunday dinner. I wasn’t sure what to expect when I cut into cake and sent the slices off to be served to my family members. Maybe a total disappointment? This cake was amaaaaazing. Because of the liquids and yogurt in the batter, the cake layers had a texture almost like a tres leches cake. It was like the almond cake layers had been slightly soaked in a sweet creamy milk and then chilled. 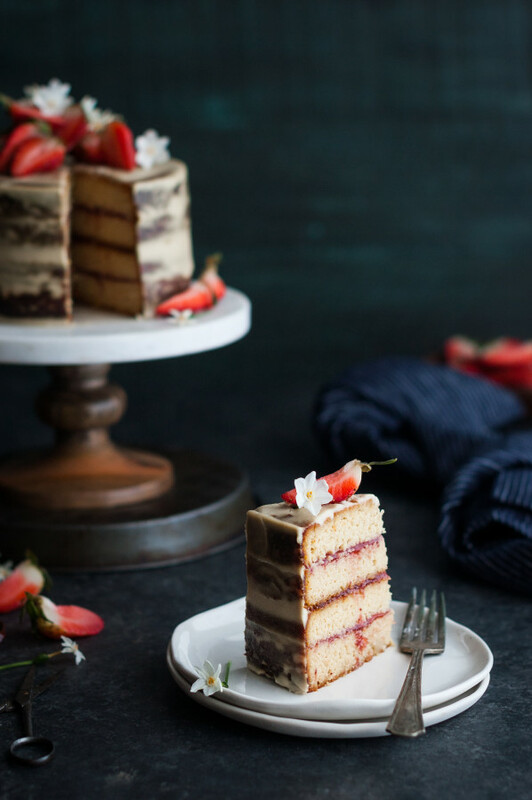 Those creamy layers of cake along with the strawberry jam and not overly-sweet cashew frosting were so perfect together and I was SO grateful that I made sure to write all the ingredients down. This is a cake I will make again and again. Each member of my family agreed that it was amazing as well. So I left them a sliced or two and then horded a few slices in the back of my refrigerator so that I could make sure that the cake was still as good as I though it was for the next few days (I do this because I really care, folks. Quality control is a job I take very seriously). *Remember to soak your cashews the night before you want to make this cake. If you forget, place your cashew in a mason jar, pour very hot water over the top of the cashews to cover by an inch, and let sit for an hour. Drain and use! 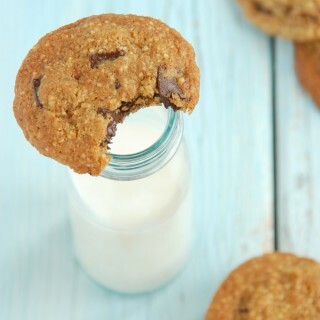 that do not have any sugar added to them. There are several brands out there that only use fruit juice to sweeten – or only the actual fruit itself, though you may need to look at a natural foods market to find them. *This cake is best served and eaten within the first 48 hours. This is not one that you want to make way ahead of time. Preheat the oven to 350 degrees. Grease two 6" cake pans and line the bottoms with parchment paper circles. In a mixing bowl, whisk together the almond flour, tapioca starch, coconut flour, salt, cream of tartar, and baking powder. Set aside. In another mixing bowl, beat together the eggs, honey, vanilla, almond extract, almond milk, coconut oil, and yogurt together until smooth and well combined. Add the dry ingredients to the bowl of wet ingredients and whisk together until just smooth and lump-free. Divide the batter between the two prepared cake pans and bake in the preheated oven 40-45 minutes. Test for doneness by inserting a toothpick into the center of the cakes. Remove from oven when toothpick comes out clean. Let cool in pans for 10 minutes. Remove layers from pans and refrigerate until fully cooled. Drain the cashews and placed them in a high speed blender along with the almond milk, vanilla, salt, honey, and lemon juice. Process for several minutes, scraping down the sides as needed, until very smooth. 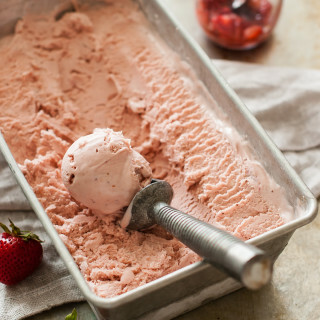 Scoop into an airtight container and refrigerate. When the cake layers have cooled, cut each layer in half horizontally so that you have four layers of cake. 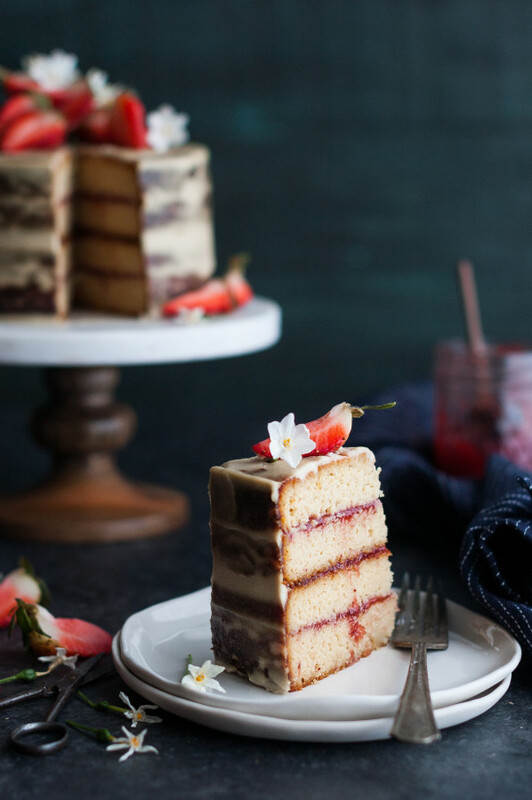 Place one layer of cake on a cake stand and spread strawberry jam across it in an even layer. Set another cake layer on top of the jam and top that layer with jam as well. Place another layer of cake on top of that jam layer and spread with jam again. Place the last layer of cake on top of that layer of jam. Frost the cake with the chilled frosting. There should be just enough frosting to give the cake somewhat of a 'naked cake' look. It won't be entirely covered in frosting, it should have just enough to patch it together leaving it with a rustic look. Top the cake with sliced strawberries.